Non-conventional and juicy: here they are, the colorful and extremely communicative graphic lamps made for Delightfull’s new collection. 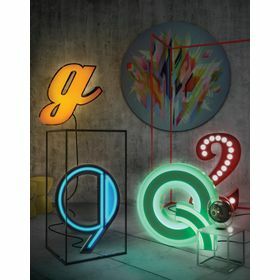 Ideal for hotels and clubs, these floor, table and wall fixtures will revolutionize the lighting concepts, arriving in form of letters, numbers or symbols.Each lighting letter is based on a wide selection of iconic type fonts with a Delightfull twist. We must say: personality has arrived with these juicy graphic lamps.